It has been a very busy year doing various things. You can see lots of my fabrics in Desmond's new cottage on BBC 2's Normal for Norfolk Episode 1 www.wivetonhall.co.uk. I have also been having a lovely and exciting time being an Interior Designer. Projects for Wilson Development included designing 8 bedrooms at The Dial House in Reepham with an 18th Century Grand Tour theme and then I went on to do 11 bedrooms in the new hotel wing at the The Assembly House in Norwich which is a very grand and beautiful building. There is currently a selection of prints of my flower paintings in the Spring Forth exhibition at The Noverre Gallery at The Assembly House. My training was in Printed Textiles at Manchester Poly and the Royal College of Art rather a long time ago and I have always painted fabrics for bespoke curtains and wall hangings but have done lots of other things as well. Recently I have been working on Interior projects for 2 local hotels for Wilson Development. I have designed the bedrooms for The Dial House in Reepham and The Assembly House in Norwich picking the fabrics and furniture and pictures etc.. I have done lots of things at Wiveton Hall including the cafe and the shell mosaics, help with the holiday cottages interiors and the drawings for the branding and the web site. You can see other older work at www.annabelgrey.com. Here in this shop I have curtain fabric and cushions and oil cloth. I also have prints and bags and padded coat hangers, wash bags etc etc. Everything is made in the UK. The fabrics are digitally printed and the tea towels are screen printed in the UK.With digital printing you can print the drop of your curtains so you don't get any wastage on the repeat though there is a small fee for this now. Do not hesitate to call for clarification or help or if you want something in particular. 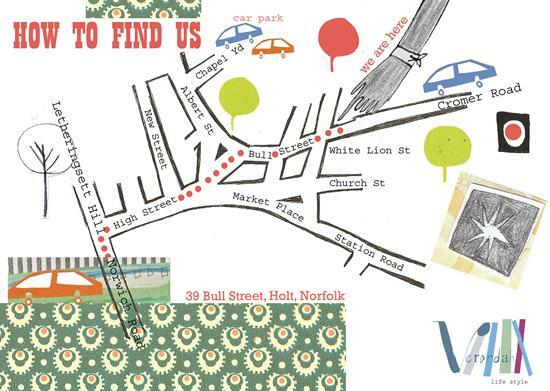 You can now see my things at Verandah Holt and also in Verandah Norwich in Upper St Giles.